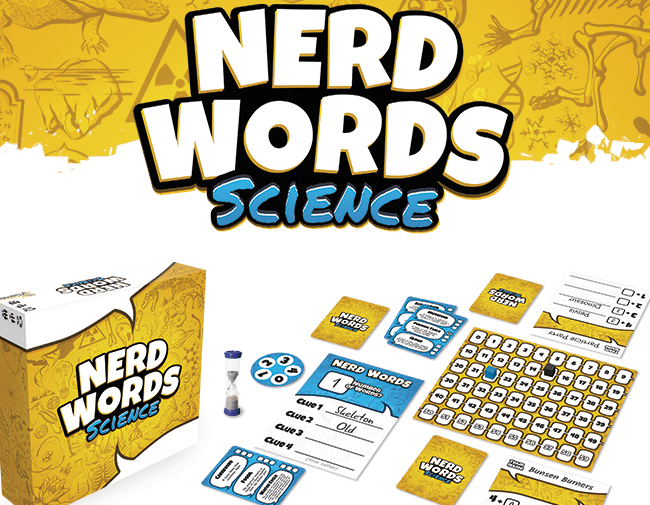 Kickstarter Alert – John Coveyou asks to use your words in new game, 'Nerd Words: Science' – AiPT! A ‘thinky word game’ for everyone to enjoy — science nerd or not. For the past few years, John Coveyou’s Genius Games has thrilled players with his science-based, educational board games. AiPT! spoke to Coveyou during the Kickstarter campaigns for 2017’s Cytosis: A Cell Biology Game and 2018’s Periodic: A Game of Elements. Both campaigns smashed through their goals many times over, and in case you missed out, the games are still available on Kickstarter or through Amazon. They could have stopped there and enjoyed their massive successes, but not these folks! In January they launched a majorly successful campaign for Human Anatomy Jigsaw Puzzles, and they’re currently entering the final week of another new and exciting Kickstarter: Nerd Words! Not surprisingly, it’s already funded, and it looks like a ton of fun. Nerd Words: Science is pretty much what it sounds like — a word association game based on scientific terms. It’s for two to twelve(!) players and is rated for 13 years and above. Gameplay is from 20 to 40 minutes and involves giving clue words, betting points, making educated guesses, and using methods of deduction, all while racing the time clock! We caught up with Coveyou via email to ask for all the nerdy details and to find out what more we can expect coming up from Genius Games in the near future. AiPT! : Nerd Words seems quite a bit different your previous games like Periodic and Cytosis. Can you tell us a little about how Nerd Words come about? Is it really as different as it seems? Coveyou: Nerd Words does have very different gameplay than our other games. We’ve got some serious, heavy strategy games under our belt, so this is a change of pace, but we love it. We’ve been calling it a “thinky” word game. The second twist is that teams can bet additional points on their guess based upon how confident they are! The more points you bet, the more you score if your guess is correct, but if you’re incorrect, you’ll lose the points you bet. Our co-designer, Eric Slauson, came up with the very first idea for the game … he and I were literally taking a walk, trying to figure out how to combine our powers to make a game! (Eric is an English teacher, and my background is in science, and we just really, really wanted to design together.) We tossed around a few ideas and settled on some type of word game but couldn’t figure out what would make it unique. Then a few days or maybe weeks later (I don’t recall the exact timeline), Eric messaged me with the idea that clues have to start with a letter in the science term, and that gave us something unique, and really fun. I was immediately intrigued by this clue restriction mechanic, as well as the challenge of figuring out how to make a word game that was science-themed … those two themes don’t usually go together! Not only would this be Genius Games’ first word game … to my knowledge there really aren’t ANY word games out there that incorporated actual science or use this new mechanism. AiPT! : How did you decide which words to use for this game? If someone has a somewhat limited experience with science or works in a narrow scientific field, are they going to be able to recognize most of the words in play? Coveyou: Oh yes, the goal was to use a very broad range of science words that would be familiar to most people. The rule of thumb was that everyone would have at least heard the word by the time they hit middle school science. We pulled terms from biology, chemistry, physics, and earth sciences, and each card has words from three different disciplines. Each word also has a description below it to help people who still are not sure what the word means. If people only half remember the words … well, in this case, that actually adds to the fun! For anyone with a strong science background who might want to get involved with Nerd Words, we are in the process of collecting even more science terms to include in the game! Email us at team@geniusgame.org or send us a Kickstarter message through the Nerd Words campaign to get involved. We’d LOVE to tap your expertise! AiPT! : You’ve mentioned to us before you’d like to incorporate more earth science and physics. Did you get to go deeper into that with this game? Coveyou: Yes, we did! The base game of Nerd Words pulls terms from physics and earth sciences, along with very basic biology and chemistry. We are planning to have an add-on pack of 18-27 more cards that will be completely devoted to earth science terms. Not only will the pack be completely focused on earth science, it will include terms that are more advanced than you’d find in the base game and will draw on specialized areas within earth science such as ecology, geology and oceanography. AiPT! : Tell us a bit more about the current add-on packs. Do they introduce new areas of study or dig deeper into specific scientific fields? Will there possibly be more categories in the future? Coveyou: So, our current add-on packs are Space Science (which highlights terms from astronomy, astrophysics and cosmology), Earth Science (covering ecology, geology and oceanography terms), Advanced Biology (biochemistry, microbiology and molecular biology) and Medical Sciences (anatomy, physiology and basic medical terminology). The whole purpose of the add-on packs is to go deeper into specific or technical terminology than you would with just the base game. For example, if you get the Advanced Biology add-on pack, you’ll move from middle-school level biology terminology to high school and even college level terms, which increases the challenge – and [you] know gamers and scientists love a nerdy challenge. This also creates opportunities for teachers to use the game as part of their curriculum. We’ve had tons of requests for specific add-on packs, so we’d definitely like to create more! AiPT! : We talked with you before about your hope to introduce more people to science. The games do seem to draw a fairly diverse crowd as it is, but, despite its name, Nerd Words‘ gameplay doesn’t appear outwardly “nerdy” to onlookers. Do you think this could help bring in new players, perhaps without even realizing they are learning or using science terminology? Coveyou: I’d love for as many types of people to play it as possible – whether they think of themselves as science nerds or not! It is certainly the most approachable game we’ve made yet. You don’t have to have a background in science to play well and the rules are very simple. And the definitions for each term are included on the cards so the clue giver can get a jumpstart thinking about possible clues to give. AiPT! : This game also looks like it could potentially be a lot of fun as family game and a helpful way to assist school-age kids in their studies. Could there possibly be future packs for family play so that younger kids can get involved, perhaps after they kind of age out of your children’s book range? Coveyou: Hey, that’s not a bad idea and that could work well! I’d consider it, even though our target age range in general is middle school and up. I will say that so far, we’ve had a wide range of kids playtest the games, and it seems that even those younger than middle school are able to engage with and improve their understanding of the terms in the base game. So, the base game is already meant to be pretty family friendly. AiPT! : We always love to know about stretch goals- are there any for this campaign? Coveyou: We decided to offer add-on packs as an option for any Nerd Words backers and not offer any stretch goals for this campaign. Nerd Words‘ gameplay is already very streamlined and clean – we think this suits the style of the game well and so are keeping things simple! And the game has very few components, so there is little to upgrade. AiPT! : You’ve done several games so far, what number is this one? Are there other games being planned for the future? I’m working on a heavier euro-style engine builder game called Physics Park. It’s about the Newtonian physics of an amusement park and we’ve officially contracted with Geoff Engelstein (most notable for hosting Ludology Podcast) to development that game. I’m working on a Mendelian genetics game with Paul Salomon, currently called Genotype, and [I’ve] officially contracted Ian Zang to do development on that game. In Genotype, players are manipulating traits in pea plants and betting on the next generation. I’ve also got several really tight math games in process that I’ve been working on with Steve Schlepphorst, who recently started doing game development part-time at Genius Games. These games focus on foundational concepts like division, multiplication, fractions, and decimals. And there are many more that we are still working on that are not far enough along to announce yet! If anyone wants to join our playtesting group, where we discuss games in development, you can join our Facebook group called The Geekiest Science Game Playtesters Around! The Kickstarter campaign for Nerd Words: Science ends April 11th! During the campaign you can snag a great deal and get a copy for $19+shipping, or at the $29+shipping level you can have the game plus all add-on packs. After the campaign ends, they’ll open up the pre-order option and retail will start at $30.